Connect your Chromebook™ to a VGA projector or desktop display and add Ethernet + 1 USB 3.0 port, in a convenient adapter bundle. The SAMC2VGAUGEK Accessory Bundle for the Samsung Chromebook 2 & Series 3 is an add-on kit containing two StarTech.com adapter products that let you extend the display and network capabilities of your port-limited Chromebook. The kit contains an HDMI to VGA adapter to connect your Chromebook 2 or Chromebook Series 3 (or similarly configured laptop) to an external VGA display or projector through the HDMI output. 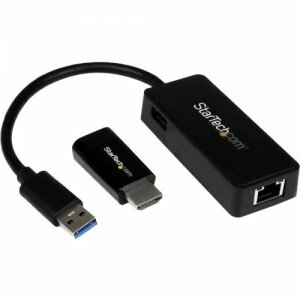 Also included is a USB 3.0 to Gigabit Ethernet Adapter, which adds wired network support and offers the added benefit of an integrated USB pass-through port to keep your USB 3.0 port available for other peripherals. Though extremely portable, the Chromebook often lacks the necessary ports to connect to various desktop displays/projectors and wired networks when traveling between boardrooms, home / remote offices, trade-shows, hotels and conference centers. Perfect for offices using a hot-desking model, we designed this bundle of Chromebook accessories to provide the missing connections most commonly needed among mobile users, to prepare you for almost anything.